Fourth Row Center: Film Writings by Jason Bailey: On DVD: "Sherlock Holmes"
The character of Sherlock Holmes is one of the most durable in modern English literature, and one of the most frequently seen characters in all of film (second only to Count Dracula, in fact), but no one seems all that interested in making a straightforward Sherlock Holmes movie. Since the glory days of the Rathbone/Bruce Universal pictures, most of the Holmes-centered films have been "high concept" interpretations--i.e., "Holmes as a teenager" (Young Sherlock Holmes), "Holmes as a bumbler" (Without a Clue), even "Holmes as a cartoon mouse" (The Great Mouse Detective). Guy Ritchie's 2009 Christmas hit Sherlock Holmes hangs on a simple high concept of its own--"Holmes as action hero." It's such a neat and easy fit, you wonder why no one thought of it before. The screenplay (by Michael Robert Johnson, Anthony Peckham, and Simon Kinberg) works in much the same way that William Goldberg's script for Butch Cassidy and the Sundance Kid did: by importing a quippy buddy comedy dynamic into a seemingly incongruent time and place, and taking it for a spin. Purists may howl in protest, but it's a bold, frankly refreshing take on a character that could have been lazily imbued with easy iconography (there's not a deerstalker cap or calabash pipe in sight, and the words "Elementary, my dear Watson" do not pass his lips). Instead, this Holmes is as skilled with his hands as he is with his brains--and uses them together, as illustrated in the masterful opening sequence, which finds Holmes easily dispatching a husky guard with well-planned fisticuffs. The dastardly, black arts-dabbling villain caught in that opening sequence is Lord Blackwell (Mark Strong), who is quickly sent to the gallows. 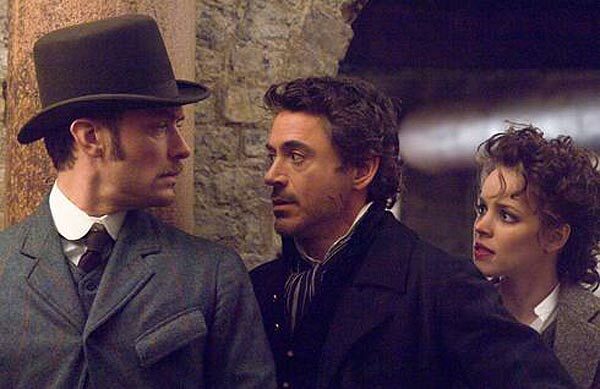 But the case is a bittersweet one from Holmes (Robert Downey Jr.) and his faithful assistant, Dr. Watson (Jude Law)--it will apparently be their last one together, as Watson is departing their lodgings on Baker Street and is planning to marry. But something goes awry with that last case. Blackwell calls Holmes to his cell and warns him that "three more will die"; a short time after his hanging, he up and vanishes from his grave. Since Watson was the attending physician at said hanging, and confirmed the lack of pulse, his reputation is on the line. And then there's Holmes' lost love, Irene Adler (Rachel McAdams), who approaches Holmes with an offer that seems to dovetail strangely with the Blackwell investigation. The plot is mighty convoluted, but it's thrown together with high energy and good cheer by director Ritchie, making his first decent picture in nearly a decade. He's clearly having a great time making a big studio period piece, filling it with bold, well-composed frames, spry camera work, and clever editorial trickery, playing up his action set pieces (like the crackerjack fighter scene in the lab of "the ginger midget," which spills out into the London streets and out to the docks) but also vibing off the rat-tat-tat comic repartee of his stars. The script cleverly constructs their friendship as equal parts camaraderie and co-dependence; Watson, a former military man, gets a jolt off the adventures they share, while Holmes digs the notion of trading barbs and deductive notions with an equally matched companion. None of this is terribly original in general, but it does add a spark to our traditional notions of the Holmes and Watson relationship. They've also got the right cast for this particular interpretation. There may be no star working today who is as much fun to simply watch act as Robert Downey Jr.; his personal misadventures have made him a more pleasurable screen presence than ever. You can see a twinkle in his eye, a spring in his voice as the words bound out of his mouth--he's having a great time up there. He's not winking at the audience or half-assing the performance (the way that, say, Burt Reynolds did for all those years); he's simply conveying the sheer joy of performance. He's also not afraid to make his Holmes a little bit crazy, as in the great solo scene where he tries to puzzle out the case, staring straight forward as he plinks his violin, writing on the wall behind him, voices in his head, his thought patterns all over his face and tied right in to the camera's smooth dolley out and back in. Jude Law, who can be a dreary drag when cast in the wrong role, is exactly the right choice for this one; looking over his filmography confirms that, good looks be damned, he's at his best not as a leading man, but as a supporting player allowed to let his freak flag fly (see Road to Perdition, A.I., I Heart Huckabees, etc.). He's evenly matched with Downey's loopy Holmes, workmanlike and occasionally put-upon (finding his friend all out of sorts, his picks up a bottle nearby and snorts, "You do know that what you're drinking is meant for eye surgery?"). Mark Strong is an awfully good villain, cold and calculating, while Eddie Marsan (from Mike Leigh's Happy-Go-Lucky) proves a terrific foil. Rachel McAdams, though, can't do much with her thin role (her character is a third wheel, and is played like one), but she does what is required--i.e., looks fetching and smiles slyly--about as well as you could hope for. The production and costume designs are first rate, and Hans Zimmer's janglingly enjoyable score keeps things zipping right along. It is, as you've probably heard, entirely too long, but it's not poorly paced (as countless shorter films are). The multiple climaxes are over the top, sure, but they're engaging; besides, Ritchie manages to trot out a whirring-saw sequence, a device with a ticking clock, and a swordfight at ridiculous heights. These are throwback devices (the kind of Saturday serial scenes Spielberg was giving shout-outs to in Raiders), lovingly indulged. Ritchie's clearly having a ball making his movie, and it's infectious. Sherlock Holmes may not be a terribly disciplined picture, but that's part of its charm--it tosses in equal dashes of mystery, suspense, romance, bromance, and stuff blowing up. It also gives us a once-promising filmmaker rediscovering his instrument, and a gifted actor knocking us out with a good old-fashioned movie star turn. As popcorn entertainments go, you could do a hell of a lot worse. "Sherlock Holmes" is now available on DVD and Blu-ray. For full A/V and bonus feature details, read this review on DVD Talk.